The trend for falling Weems Plantation home values continues, as this "newish" NE Tallahassee neighborhood fights to keep from being overrun by distressed property sales. Like in many other neighborhoods born just before or during the boom of the housing market, Weems Plantation home owners are likely to find themselves on a similar move-cycle as their neighbors, which isn't good during a buyers market. Currently, there are only 3 homes for sale in Weems Plantation, but I would be concerned about more coming onto the market. As we see in the real estate graph above, distressed property sales are on the rise, and this is driving down home values. 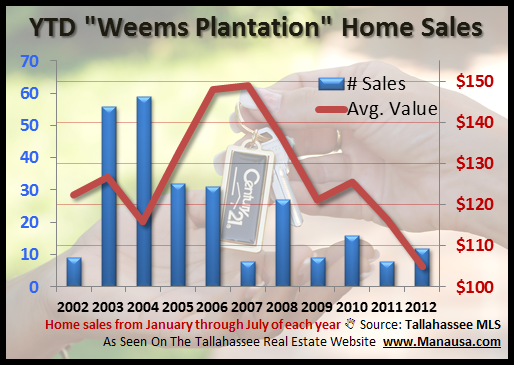 Thus far in 2012, the number of Weems Plantation home sales seems to be consistent with the past few years, but only a fraction of the pace of what we saw at the boom of the housing market. What is going to happen when that large group of people decide to move? 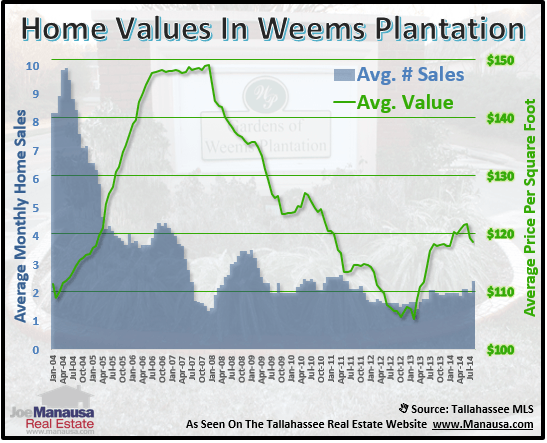 The average sales price of a Weems Plantation home in 2012 has been $158,600, down about 24% since the peak of the housing market. 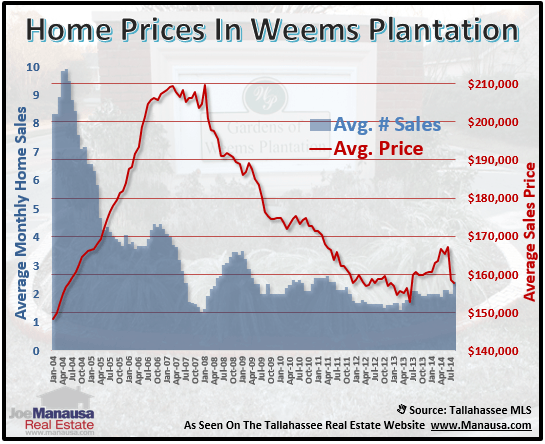 While it looks like prices might be on the mend, the reality is that the average size of homes sold in Weems Plantation this year is 10% larger than any previous year. This means buyers can spend more, but demand more for their money. The average Weems Plantation home value thus far in 2012 is $105 per square foot, down 30% from the $149 per square foot attained in 2007. Values thus far are down 8% in 2012 versus the 2011 average, so home owners need to understand what it takes to get moved. If you are thinking of selling a Weems Plantation home, I can help you find the best possible value in today's tough housing market. If you would like to see how, just drop me a note and we can schedule at time to see how our plan will work for you..